We are not much different than burdened travelers, are we? We roll in the mud of self-pity in the very shadow of the cross. We piously ask for his will and then have the audacity to pout if everything doesn’t go our way. If we would just remember the heavenly body that awaits us, we’d stop complaining that he hasn’t healed this earthly one. Andrew Peterson’s latest single. Great song. Sometimes we see ourselves as sinners in the loving arms of a God who is pretending not to see us as we really are. In our minds, maybe God is wearing a pair of “Jesus glasses” that hides our true state from his vision. We find it difficult to grasp the idea that God calls us righteous because we actually are righteous. It feels more humble to believe that we’re filthy worms awaiting a future change into beautiful butterflies. Jesus stated it best. He said that our righteousness must surpass that of the Pharisees in order to enter the kingdom (Matthew 5:20). So if we Christians don’t claim to possess perfect righteousness, we’re lowering God’s standard. We’re watering down the gospel. We insinuate that Jesus can unite himself with sin. And we insult the perfection of God. Only perfection will do. This is precisely why God had to make us perfectly righteous in our human spirits through our own death, burial, and resurrection. With its apparent humility, this filthy worm theology appeals to the flesh. But God certainly doesn’t condone our wallowing in poor self-image. The risen Christ doesn’t join himself to filthy worms. The Holy Spirit doesn’t dwell in dirty sinners. Christ only unites himself with those who are like him in spirit. The Holy Spirit doesn’t reside in someone who remains even 1 percent flawed by sin. But we’ve been perfectly cleansed. And we’ve been made perfectly righteous at our core through spiritual surgery. This is the only way we can enjoy even a moment of relationship with Jesus Christ. I have often used the same analogy Farley mentions above, of God looking at us through “Jesus-colored glasses,” and I realize I may have been incomplete in my explanation in the past. Not to be repetitive with Farley’s own elaboration, but my meaning has always been that when God sees a believer, he sees perfection, as when he sees Jesus. As when he sees himself. This is who we are, fellow Christians. We have no need to add to it. It’s impossible for us to do so. There is no magic checklist we can look at to see how our perfecting is going. At the same time it is ongoing, it’s also already done. Why can we not accept that? What are we afraid of? Knowing who we are, righteous before a perfect and holy God, should fill us with hope. A hope we should be passing on to our fellow man. Know who you are. Be who you are. Not to lord it over others, as the Church has too often been wont to do for years, but to show God’s love to the world. He has chosen to work through us, and we should joyfully allow Him to do so. No offense to ebooks and Kindle, which have their place, but there’s no substitute for a book that has an actual history, that takes up space on a shelf, that has been somewhere, strapped to the back of a bike, that was being read in a British boys’ school library while Lewis was still teaching at Oxford. Thank you, Lord, for books. Not just the words, but actual physical books you can hold in your hand and touch and smell, and ponder where they have been and what lives they may have touched. It’s a good thing, I believe, to remember the dead — especially in a culture that trivializes death. We shunt it aside to the fantastic realms of video games and movies, and call it by other names when we do it to old people and unborn infants, and all of this is a way, I think, of grasping life in the wrong way, in a way that reveals the underlying belief, for many of us, that our lives are about our gratification. That’s such a big word for an experience that is so very small. Gratification is as far removed from joy as hunger is from a great feast, and yet we forsake the latter in pursuit of the former because joy, like a feast, requires sacrifice. So it’s a good thing to remember those who gave their lives in sacrifice for others. Think on them, and if you like you can light a candle or mutter a prayer, a prayer that you and I and the rest of the world will, if only for a slender day, give ourselves over to loving someone other than ourselves, which means the great sacrifice of setting down our hurts and lusts and grievances and entitlements, all of which are chains with heavy anchors, but which we gather to us like treasures. But today, if only for today, what say we lay them down? 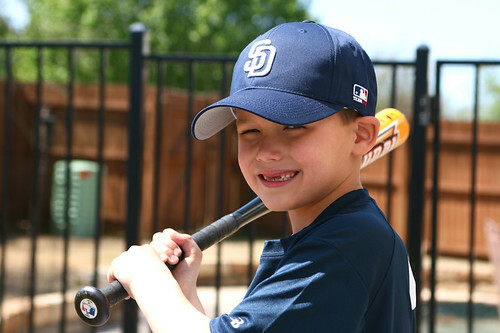 This spring, Davis started playing baseball. At the six and under level (6U), it’s coach-pitch. He did pretty well, and we saw improvements in his fielding from that first practice to the last game this past Saturday (May 22d). Hitting wise, he did awesome, going seven for eight in the first half of the season. He hit a slump, but rebounded for the last two games. To see more photos, including a couple from the game, check out the rest of the set. From back in March. 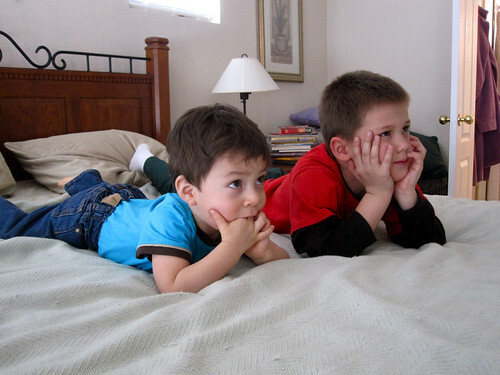 While I was getting myself ready, the boys watched Sesame Street in Mom and Dad’s room. Grace is the system that the Holy Spirit uses to counsel and teach us on a daily basis. Grace is in place, whether or not we’ve sinned recently. We worry that an absence of law will result in a lifestyle that is out of control. This concern is natural. But is contradicts what the Scriptures say about the effects of grace. grace isn’t just a treatment for sin; it’s actually the cure for sin! When we question the function of grace in our lives, we’re insulting God’s intelligence. Would he users in a New Covenant that not only allows but actually promotes sin? Is God foolish to think that grace really motivates us to live godly lives? The secret is that grace deactivates our pride. Removing the law from our lives means our self-effort is no longer prodded to control behavior. The law excites human effort. It encourages us to depend on resources outside of Christ. But unconditional acceptance deactivates human effort and allows the Holy Spirit to be all that he wants to be through us. Our greatest fear is that we’ll be out of control. But we were never made to be in control. Self-control has always been a natural attribute of the Holy Spirit. The reason he lives within us is to produce the self-control that we’re afraid we’ll lack under grace. Does conservatism give Christianity a bad name? This has been sitting in my NetNewsWire sidebar for two and a half years. So better late than never, I suppose. The best inoculation, I think, to a wrong perception that Christianity is equivalent to conservatism is the mercy work of many good churches. For every politico a non-Christian sees claiming the Christian label, we want him to see a hundred Christians in his community, quietly, humbly doing the work of our Father. The more we can accomplish that, the harder it will be for people to identify Christianity with whatever happens to be popular among politicians who claim to act on Christ’s behalf. “You will know them,” Christ said of the good and the bad, “by their fruits.” My prayer, in the current political season and the decades to follow, is that more non-Christians will come to know us in that way, by lifechanging encounters with loving Christians.